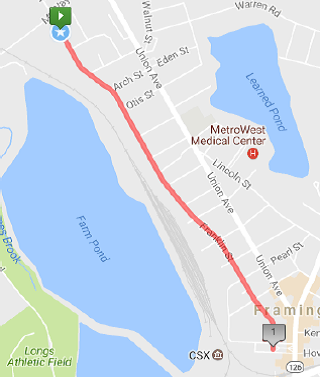 On Saturday, May 4, 2019, the Greater Framingham Running Club (GFRC) and Downtown Framingham, Inc. will be holding its 3rd Annual Framingham Mural Mile road race and kids dash in Framingham, Massachusetts. This one-mile, point-to-point road race starts at 9 AM at 438 Franklin Street and finishes at the Downtown Common (42 Franklin Street). The 200-meter kids dash (ages 10 and under) starts at 64 Franklin Street (Proctor and Franklin Streets) and finishes at the Downtown Common. The fee to register is only $15 before April 1, $20 after that date and $25 the day of the race. For the kids dash, one child is free with an accompanying adult registration for the Mural Mile. There is a $5 registration fee per child (without accompanying adult and for each additional child if first child is free with accompanying adult). After the race, join us at the Downtown Common to celebrate Sorin Bica's famed downtown Framingham mural. There will be local artisans, live art, post-race food, vendor tents and more. Running club members, volunteers, spectators and, of course, runners everywhere…we look forward to seeing you all there.